What do you do when you can't pronounce a name? These questions came to mind as I was working with a mining organisation last week. I met a South African person who came to Australia a few years ago to work on a Queensland mine. His name is spelt as 'Dawid' and pronounced as 'Dahwid'. Shortly after arriving in Australia Dawid realised that his colleagues were referring to him as 'David' in their verbal and more formal communications. Dawid gave his name great thought, questioning whether he should simply change his name to David to make life easier for those around him and to assist him to 'fit in' to life in Australia. As our lives become more globalised we find ourselves encountering people with unfamiliar names more and more. Correct pronunciation and remembering unfamiliar names can be both challenging and anxiety provoking; it isn't as though we can turn to a dictionary or ask others for help when we are 'in the moment'. Speak up early if you have trouble. 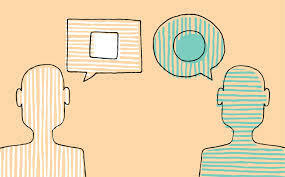 If you can't pronounce or remember a name don't let time pass; remember it becomes even more difficult as time goes on. Cultural Synergies is holding a CQ Assessment Tool launch in Melbourne on 7th May. We would like to extend an invitation to our subscribers. Please contact Emma Thompson if you would like to attend. Ethical thought leader Mark Pastin has an impressively diverse professional background. 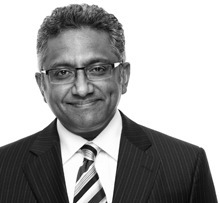 His advisory roles extend from NGO’s, to both private and public companies. Dr. Pastin was also the founder of the Council of Ethical Organizations and has served as faculty member and administrator at Indiana University, the University of Michigan, Harvard University, University of Maryland, and Arizona State University. How do we improve the ethical status of our societies? Pastin believes that we can make a difference, that we all have an innate ethical sense that he refers to as an “ethics eye”, that is the ability to see what is right and what is wrong. He acknowledges that ethics poses complex and difficult challenges that call for creative, practical, realistic approaches. One of the appeals that this book had for me is that it is about approaches rather than opinions. I enjoyed the insights based on his observations regarding why people make poor ethical choices and the strategies for resolving these poor choices. He offers some great tools to sharpen your own personal ethics and provides some interesting approaches to achieve ethical agreement with others. I appreciated Pastin’s down to earth, pragmatic approach. 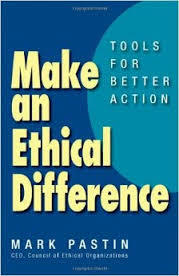 "Make an Ethical Difference: Tools for Better Action" By Mark Pastin (2013).